There are plenty of great beach towns on the East Coast of the United States. How can you determine which beach town is right for you? It helps to know a little more about an area before you move, and that is exactly why TruckRental.net has decided to focus this article on one gem of a beach city, Virginia Beach, Virginia. Come along with us, as we explore everything this great beach town has to offer. The city of Virginia Beach is pretty large when compared to some other cities in the United States. It is just under 500 square miles, and the total square miles are almost equally split between land and water. There are 248 square miles of land, and 249 square miles of water. 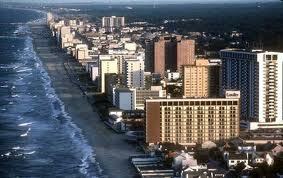 There are roughly half a million people that call the city of Virginia Beach home. That is a lot of people, but because Virginia Beach is so large, people are spread out. On average there is just over 1700 people per square mile. It is definitely not that small town charm, but it is not nearly as crowded as San Francisco which has over 3500 people per square mile. There are still plenty of small little cities and communities outside of Virginia Beach that have that small town feel. Living in Virginia Beach will give you four very unique seasons. In the summer you can expect the average high temperature to be around the mid to upper 80s. In the Winter it can get as cold as 30 degrees, and you will see plenty of snowfall. There is an average of 6 inches of snow that falls in the area. If you are moving to Virginia Beach from the South, make sure that you have enough Winter clothes to keep you nice and warm. Almost every single beach town will be a little more expensive than other cities. Virginia Beach seems to be right on average with the rest of the United States. A loaf of bread will cost around $3.50, and a dozen eggs will cost you $2.00. The average utility bill is in the $200 a month range. A three bedroom apartment will cost in the area of $1300 per month. The rental costs are the same in the center of the city, and outside of the city. If you are looking to purchase a house in Virginia Beach, the average mortgage rate is right around 6%. There is only one reason that anyone ever lives in a beach town, they want to spend some time at the beach. Virginia Beach will offer you plenty of places to spend some time in the sun. You can choose to sit and relax, or get in and swim. Virginia is also home to some world class fishing as well. If you like the beach life, then you will always have plenty to do in Virginia Beach.